Discover the creative ways to rethink this entertaining staple. Thanksgiving will be here before you know it—we’re definitely not the only ones counting the days, right? For those hosting this year, settling on a centerpiece may register as an afterthought. While some may be guilty of resorting to displaying the inevitable florals guests will bring, we’d highly recommend making one ahead of the day. After all, a centerpiece is a crucial part of any tablescape. We rounded up a few of our favorite looks—this ombre-floral lineup, included—which incorporate a wide range of elements (read: not only flowers) to inspire you to think a little outside of the box this holiday season. Read on to discover the centerpiece ideas we’re loving right now. We’re all for utilizing the broad spectrum of hues the season has to offer, obviously, in the form of vibrant florals. Toss all conceptions of typical tonal pairings aside and mix and match to your heart’s content. Intimidated by the idea? Opt for smaller clusters, set in a line down the table, in lieu of the usual grand centerpiece. See more from this desert fete here. Anthuriums have arguably been the It florals of the year. Their tonal variations and unique structure establish them as an instant showstopper—requiring neither the need for fillers or any floral complements. Paired with an equally dynamic or modular vase and you’ll have a refreshingly simple, artful display. Opt for a sporadic mix of fresh florals, bounded by a complementary palette of autumn hues. Stick to a handful of elements (fillers, a statement floral, and a couple of softer-toned additions) to keep the look cohesive. In this arrangement, snowberry, lisianthus, and hellebore set the tone, complemented by a bulb on each surrounding plate. See the rest of this fete here. Edible centerpieces are always a good idea, especially with a hungry bunch awaiting dinner. Plus, it takes care of the appetizer round as well. Here, pickled radishes and shallots lend a subtle shade of pink to the table, complementing the Scandi-inspired theme of the board. Get the scoop on this spread here. Up for a DIY? See how you can transform a plain bunch of floral fillers and basic leaves into a show-stopping centerpiece courtesy of a little spray paint. Bonus points for setting a tablescape that emulates the tonal characteristics of the centerpiece. A centerpiece that requires no more than a single subject? Count us in. Who knew garlic scapes could double as such a statement-worthy display? We’re all for this non-floral arrangement that boasts a fair departure from the typical. Discover more unique centerpiece ideas. We’d take a still life as pretty as this over florals, any day. Start with a base of filler greens, such as lettuce or kale, and build up with a cluster of fresh apples, Brussels sprouts, gourds—the options are endless. Gather a cluster of pumpkins and gourds – go for a muted palette of greens and grays, intermixed with ivory or cream – in a shallow wire basket or tray on a bed of moss, to complement an otherwise modern setup. Channel the essence of the season with a foliage-inspired centerpiece. 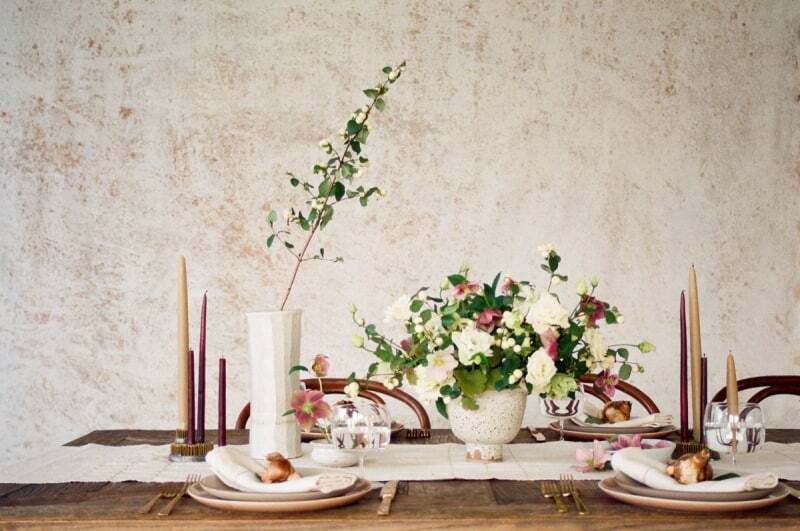 For the table that calls for rustic minimalism, elect an organic mix of bucolic accents to set the tone. Bring in a leafy branch from the outdoors, or experiment with a more streamlined variety of floral fillers. Photography by Sarah Sherman Samuel via Stories. A captivating palette of black, brass, and green lends a fearlessly bold aesthetic to a chic and modern setting. Photo by Sarah Sherman Samuel via Stories. Pair a compact centerpiece with slender candles of a complementary hue, to create an eclectic mix of decorative elements that vary in height and shade. A modest pairing of the season’s best makes for a quintessentially minimal centerpiece. Photo by Thoughts From Alice. Pair a mix of gold, silver, and copper foiled pumpkins with a handful of antiquated accents for a truly unique statement. Get the how-to on HGTV.